I have been making my project more driveable and reliable. It has been upgraded to an internally regulated alternator, leaks are being isolated and repaired, and it's time to upgrade the fuel system. I am going to spare myself the frustration and I am going to buy professionally rebuilt carbs. I look at carburetors like I look at transmissions... I can work on them, but I dont do it often enough to be good at it. It's like letting the dentist do your open-heart surgery. Better to have a qualified person doing the work. Who do you all trust? I have seen good things about Wolf, and there is a lot of mention about Steve Goodman. Budget isn't as tight as usual, but I would still like to keep it fairly low. I hear only good things about Steve Goodman. Steve gets my vote. Oh, and my carb. work. My first attempt was with Wolf it did not go well. I just recently installed my rebuilt carbs from Rafee at corvair1.com, and I couldn't be happier. He was fast, professional, and happy to answer all of my questions about the carbs and anything else Corvair. I found his price very reasonable for the quality and service I received. My car is running the best it ever has. I got my carbs from Wolf when I first got it,I knew nothing about anyone.Since then I have learned a little.I would have no problem with either. I have purchased "professionally" rebuilt carbs, as well a rebuilding them myself and, honestly upon inspection, I don't see anything about the rebuilt vs my rebuild, in appearance or performance. I don't want to sound like I'm being critical, as Wolfe Ent. did good work at a fair price. On that note, I won't buy carbs again, as I kind of enjoy working on them and adjusting them to run tip top and it only costs me a rebuild kit or two. The most specialized tool you need is a wide blade screw driver for removal/installation of the jets. The HV carbs are so simple, not like a Qjet or YH with metering rods and air bleeds, etc. The labor intensive stuff is in the prep., as I always take the two halves and check w/ a flat edge for gasket surfaces and sand lightly, as needed. Dipping carbs is fairly simple/easy as well. Just a thought, but I understand the trepidation that goes w/ repairing some mechanical things. I needed a power steering pump and was short on cash (ah, youth), so I decided to try my hand at rebuilding the old Saginaw unit. The kit cost $10-15 and once I cracked the assembly apart, it was a really simple operation and I never feel daunted when considering a rebuild vs replacement. I agree with most veverlove states except I feel "the most specialized tool you need" is the book HOW TO IDENTIFY AND REBUILD CORVAIR ROCHESTER CARBURETORS by Bob Helt (R I P). If you feel you need someone else to do them I would recommend Steve Goodman without a second thought. For now on I will be doing them all myself with some help from Bob Helt's excellent book. I have done 8 now with excellent results and they are not difficult to work on. The most time consuming part is cleaning them thoroughly. You know what? You guys are right. I just ordered Bob Helt's book from Clark's. I have two rebuild kits in my box of goodies and I have two spare carbs for any parts needed. I'm a good mechanic, and I can save a ton of money by switching to GEICO.... er, um... by rebuilding them myself! I have broken down 4 sets and watch my friend put 2 sets back together. The last set is sitting in individual containers waiting their turn for assembly. Key is cleanliness and the specs. I am breaking down another set this weekend for the Mouse Hose 110. I believe I will go through them myself. I have Bob's Book and Rick if I run into trouble. I used to build cards for my 250 6 bangers, so they aren't that much different. Steve Goodman has rebuilt three sets of carbs for me. He offers quick turn-arounds and excellent quality. Once they come back from Steve, just bolt them on, adjust the sync, and drive. After paying a professional carb shop nearly 500$ and being frustrated with the performance of my vehicle I just, literally just, rebuilt them again myself for the cost of two kits. Car has never run better. The only reason I wanted to use a shop in the first place was so that they dipped the housings and made them look original, but you know what? Berryman chem dip will make that aluminum look new without the yellow tint. These carbs are pretty simple. Follow the detail shop manual adjustment procedures, replace any worn parts and as long as you cleaned out all the crap the results are generally good. Clark's also has excellent rebuilt carbs for around $125 after core each. I had a couple rebuilt then decided to just learn how myself, they're pretty easy. I bought some carb paint from Eastwood, it's a nice touch making the top gold again and has held up better than I expected. I actually rebuilt the Holley 4 barrel on my boat, took lots of pics and followed their directions, took a long time but worked great. I bet you can do it. Will we see the car in Maggie Valley in October? It's one of those got to go to shows. 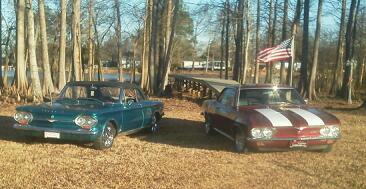 I have built 8 Corvair carbs....2 on a 110, my first Corvair, the owner who bought it said he put 10,000 trouble free miles on it,4 on my 66 140 which goes to SC and TN, and 2 on my 64 Corvair project convertible. No problems with any of them. The hardest part of rebuilding is drilling out the old jets if you want to change them which I have done a few times now....you have to be real careful there as you can ruin the carb real easy. 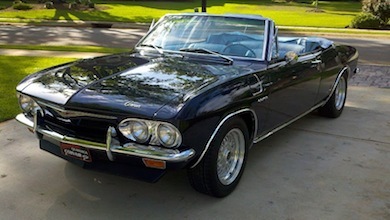 A month or two back, I rebuilt the Quadrajet on a 68 Corvette conv that belongs to a friend of mine, not my first one. He and I take our 68's to the Corvette show in Hendersonville, he will not let me touch it to adjust the opening pressure on the back barrels. He said it is running so good he does not want to touch it...LOL. He will have the car in Hendersonville tomorrow evening as we will be at the car show...I will have my 49 Fleetline as my 66 Corvair is getting ready for a brand new interior.If you want, bring your carbs there and I will take a look at them as to throttle shaft wear, etc. If you want, we can even rebuild them here at my house one day next week...I am about an hour from you.PM me if you want to do that, no charge. I think you and I met in Hendersonville once and I bought a 110 head from you when I first got into Corvairs. Only rarely do I have to drill out the main well jets. There is a special tool for these that I bet would work very well, but, I do not own one. What I do is take my largest flat blade screwdriver (I ground the sides above the tip a little so it can fit to the jet straight on) and with the supported carb on a flat surface I put the screwdriver in the jet slot and give it a good whack with a hammer. 8 times out of 10 and couple good whacks and then trying to turn it will remove the jet. I always whack it before even trying to turn it. I proceed to whack and try to twist until it strips and then I will carefully drill (left handed drill bit) and use an easy out(screw extractor) if necessary (most often if Id rill the jet will come out with the bit before needing to use the easy out). It is unusual to have to drill at all as they usually submit before this point. Agree with Ted - no need to drill out the jets. I learned from Dave motohead - manual impact screwdriver and BIG hammer. I've also removed jets that were messed up by someone using the wrong screwdriver. Bob Helts book is very good as the carburetors had many variations. I also now use soda blasting (another motohead idea) and to clean the castings followed up by water and simple green to finish them up. Chem Dip is nasty stuff to use and can discolor the castings if you leave them in too long. If you find a lot of "white powder" on a carb, then it has been exposed to water and the internal passages may be corroded. Throttle shaft wear is the biggest problem with older carburetors. If the shaft hasn't worn out the casting, to where it needs to be drilled and bushed, you are correct, they are simple carburetors to rebuild. I have an ultrasound machine that I use for cleaning after dipping them in carburetor cleaning solution. I have tried many different things with the ultrasound machine, and find that distilled water works the best for me. Then I blow them dry, and rebuild. Just take your time, and follow the instructions in the shop manual.